For Win 2000, XP, Vista, Win7 & Win8. Capture Skype video moments forever with VodBurner. Easily record, pause, and stop your recordings with our intuitive recording panel. Record Skype Calls on Windows – Skype Video & Audio with No Time Limits! Crystal-clear Skype video & audio recording on Windows. Revolutionary editing console. Create complete video production from Skype video calls. 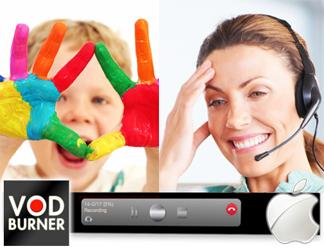 Record Skype calls on Windows with VodBurner. Create complete video productions! Capture every frame at maximum resolution. Create MP4 or WMV files suitable for sharing with others. Record each party in the video call to separate files for greater control over mixing. Edit your videos in split-screen (side by side), or this side / other side camera views with our Post-Production Console. Add subtitles and more. Crystal-clear Skype recording. Revolutionary editing. 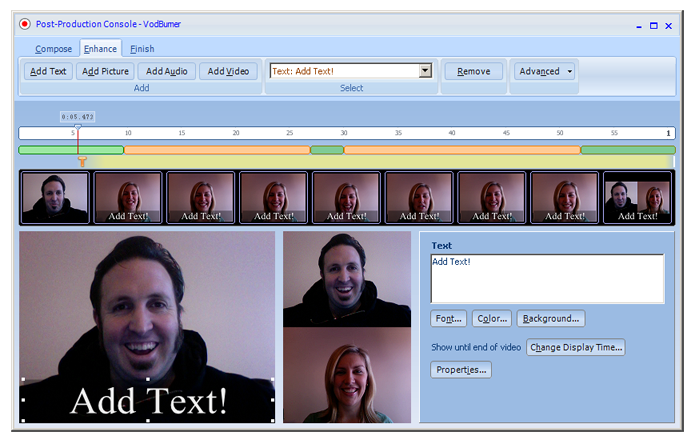 Create complete video production from Skype video calls. Download VodBurner for Windows. Free trial. 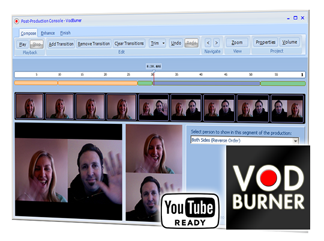 VodBurner for Windows records Skype video calls and creates complete video productions. Capture every frame at maximum resolution. Looking for VodBurner for Mac? Free rock-solid Skype video or audio recorder. Record direct to MOV, MP4, M4A and other formats.